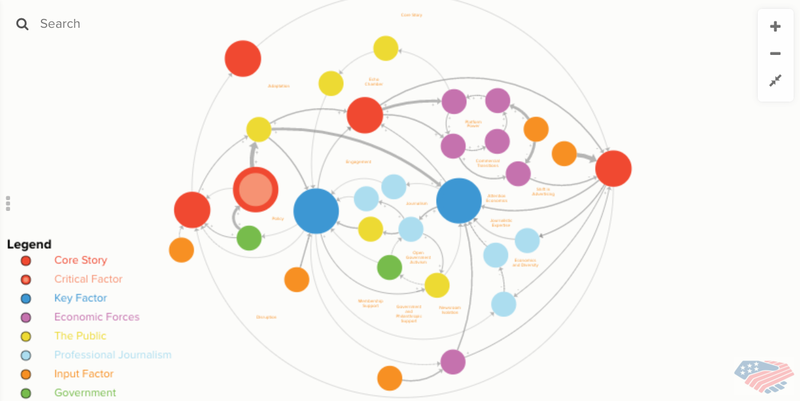 The Democracy Fund's local news "systems map" examines the factors that shape today's public square. Last month, as the national media continued to attract both attention and scorn for its sensational coverage of the 2016 presidential election circus, the Democracy Fund cast a spotlight on another, less ballyhooed pillar of American journalism: local news. 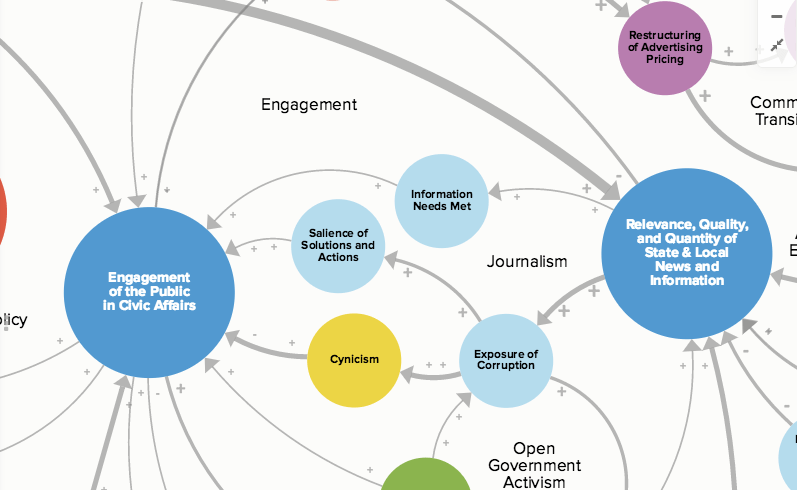 The centerpiece of the Democracy Fund’s new Local News & Participation project is an interactive systems map that visualizes how citizens gain information and participate in democracy. Version 1.0 of the map notes that, among other trends, the ability of news organizations to create inclusive public squares is diminishing, as partisanship and personalized content produce fragmented “echo chambers” instead. With its systems map, the Democracy Fund joins a host of other organizations, including the Dodge Foundation, the Agora Journalism Center, Journalism that Matters and the Center for Collaborative Journalism, that are trying to point the way toward solutions for local news. Tom Glaisyer, program director for the Democracy Fund, says the goal in this case is to help journalists better understand the modern news ecosystem and how it informs civic life. One question raised by the map is how journalists can facilitate a public square in a media ecosystem that’s becoming increasingly fragmented. The interactive map helps show how various factors, including partisanship, advertising-based business models and social media algorithms, contribute to the “echo chamber” effect that distances citizens from diverse perspectives. A screenshot from The Democracy Fund’s local news systems map. “The public square used to consist of a small number of large outlets with great reach, but as the world becomes more digital, we’re ending up with a larger number of smaller outlets,” Glaisyer said. “You get a wider range of voices, but the question is how much we’re listening to voices with which we disagree? And how do journalists create that interchange? Glaisyer acknowledges that the map does more to “pose questions back to us” than to offer solutions for the challenges facing local news organizations. But notably, the project does come at a moment when interest — and investment — in the future of local news appear to be surging. From Josh Stearns’ and Molly de Aguiar’s newsletter The Local Fix to the community journalism courses popping up at J-schools to the experimental initiatives launched recently by both Gannett and Advance, the media space is becoming crowded with efforts to reinvigorate journalism at the local level. Even Hollywood is paying attention to local news (see: “Spotlight“), reminding viewers what public accountability journalism can accomplish at its very best. Overall, these developments should offer cause for optimism. Sure, big questions remain about how to fund journalism and how to create the public sphere in a digital environment. But as evidenced by the Democracy Fund’s systems map and its Local News & Participation project, these questions are increasingly getting the attention they deserve.